Living in Argentina, I get to enjoy juicy and succulent beef all the time. 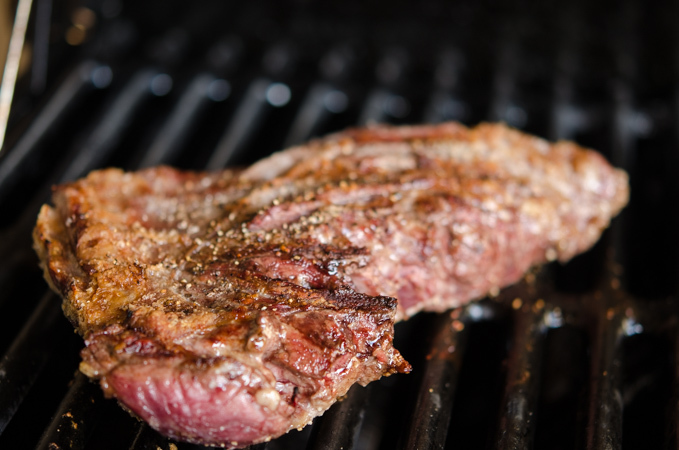 The Argentine steak (called “Parrilla”) is available anywhere. Most homes have a Parrilla grill called a “Quincho” in their backyard. I have one in my house, too, but I don’t use it much. It takes several hours to grill the chunk of meat, which requires a degree of patience that I lack. However, meat grilled in a Quincho tastes so good. You can’t beat the flavor of charcoal grilled meat over gas grilled one. Argentine beef steak is very simple. They don’t use any spices to flavor the meat. Salt is the only thing and it is just perfect. 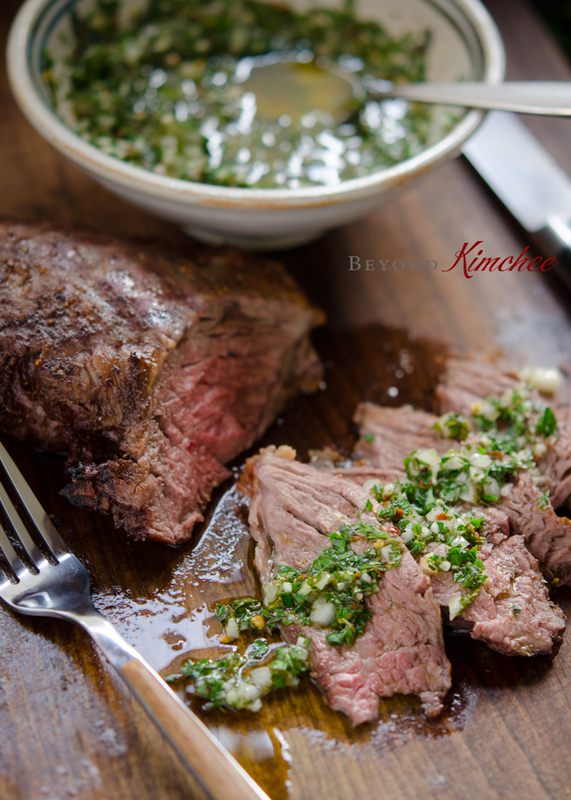 Argentine beef parrilla is often accompanied by the fragrant sauce called “Chimichurri Sauce”. 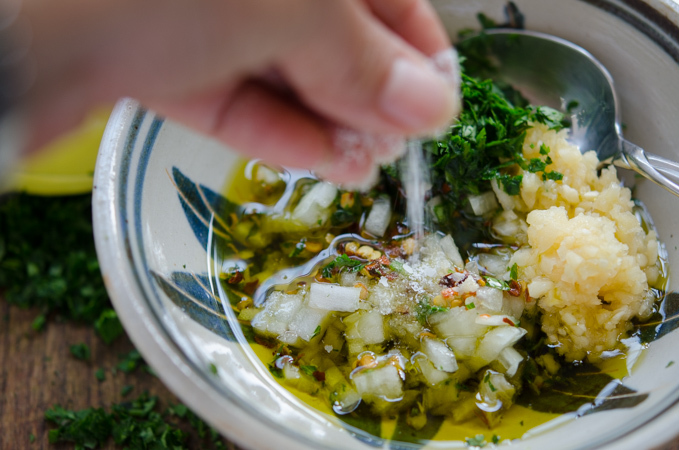 Chimichurri sauce is a mixture of finely chopped parsley, oregano, garlic, onion, olive oil, lemon juice, vinegar, and red chili flakes. I became a true convert to this sauce. The earthy yet refreshing flavor of the herb sauce not only good with beef, it partners with chicken, pork, and turkey with extra zing! 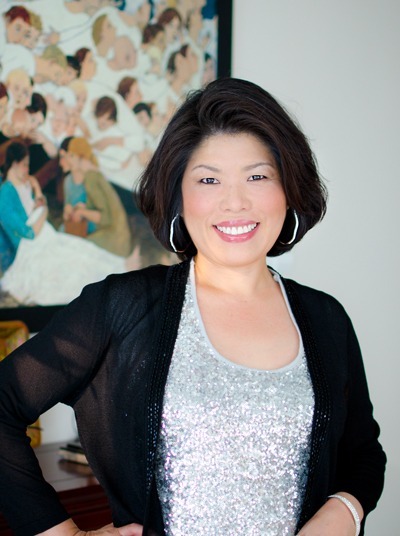 I had my Thanksgiving turkey with chimichurri sauce and it was fantastic! 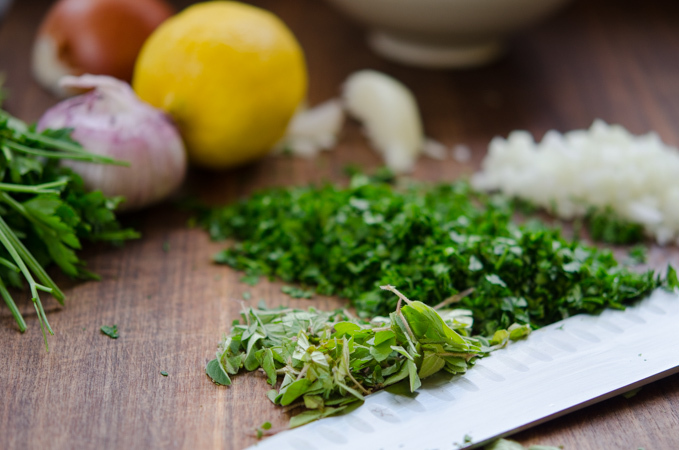 Using fresh parsley and oregano will make a big difference in overall taste. 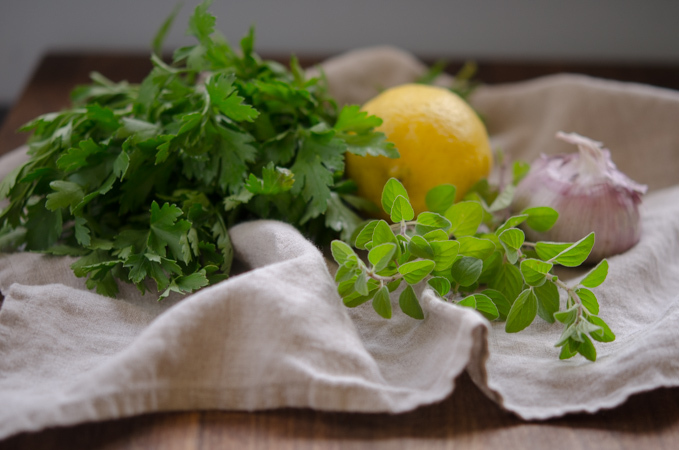 You can use dried oregano but don’t skip the fresh parsley! You will need to finely chop the herbs, onion, and garlic. As fine as you can! Mix them in a small mixing bowl. Then add the olive oil, lemon juice, red wine vinegar, chili flakes, and some salt. Mix well. That is all. Simple as can be! Heat up your grill until it is very hot. Season your steak generously with salt and pepper. 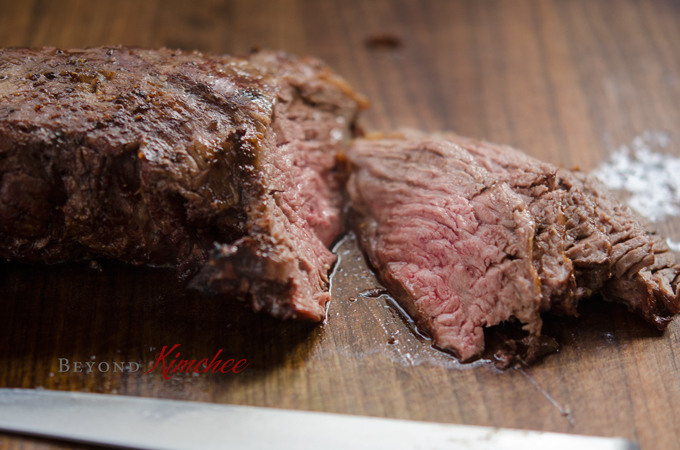 I use a Argentine beef cut called “Vacio” which is a part of flank steak. I love Vacio cut because it brings the intense flavor of beef, however, it can be quite tough if it is “well-done”. So it is important not to overkill. You can use any cut of your choice. Do you know that the tenderloin steak called “lomo” is not very popular in Argentina? Though tenderloin may be the most tender part of beef, it lacks the intense flavor of beef. I think Argentinian people know their beef. Perfectly grilled to “medium”! Mmmmm….. Juicy and succulent! I had to bring a couple of slices right into my mouth. So good! You know you have to let the meat rest for 5-10 minutes once it is done before you slice, right? Otherwise it will loose all the good juices from the meat and you will end up with dry, flavorless pieces. You don’t want that! There is a famous Korean proverb regarding meat. “Once a Buddhist monk tastes the goodness of meat, even a single flea won’t be seen in the Buddhist temple”. Steak can serve as a great holiday meal. 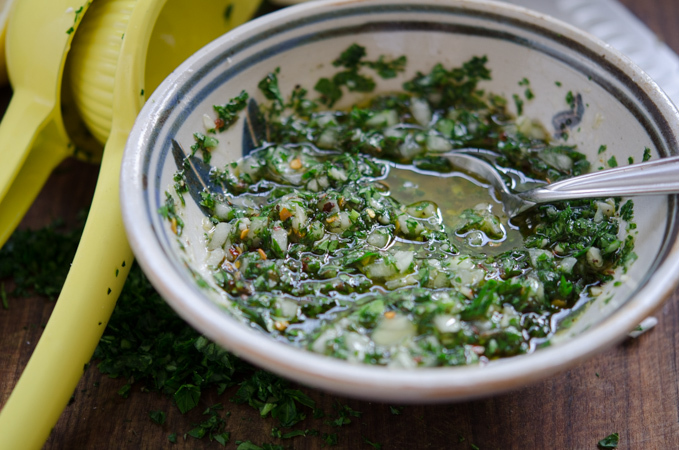 Chimichurri can stay fresh and green in your refrigerator for a few days. 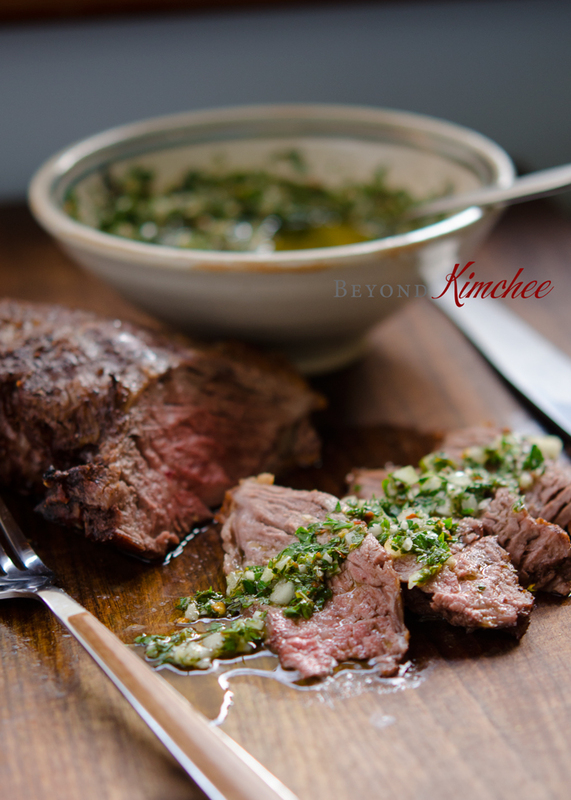 Hope you get to try this chimichurri sauce with your beef. You will love it! In a small mixing bowl combine parsley, oregano, onion, garlic, olive oil, lemon juice, vinegar, chili flakes and salt; mix well and set aside for the flavor to mingle. Heat up the grill until it is very hot. Season your steak with salt and pepper generously. Grill to your desired doneness. Medium is preferred. 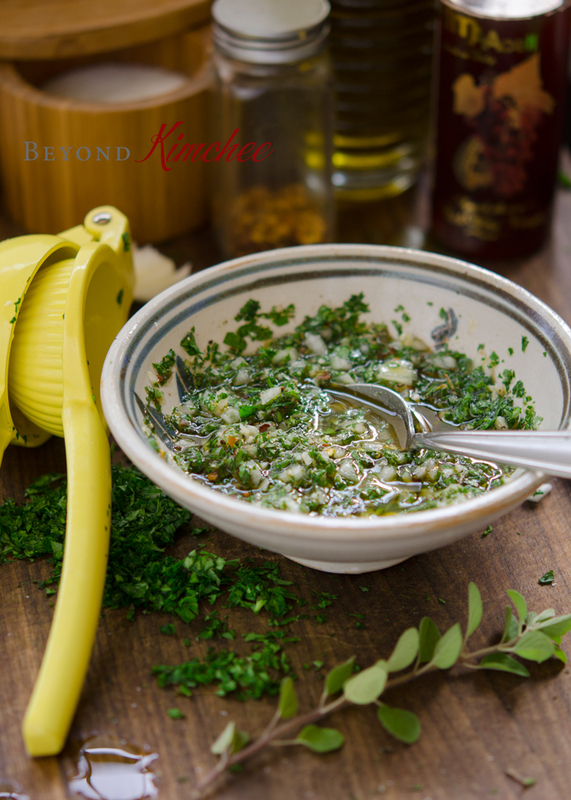 Chimichurri sauce is such a classic! And with steak? Yes, please. Fun recipe -- thanks. 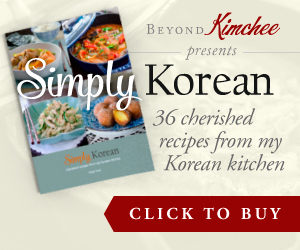 We had Korean friends born and raised in Argentina, who introduced us to chimichurri sauce. This is my favorite way to eat steak!!! love chimichurri sauce!! and this looks so delicious! We fell in love with chimichurri when we were on our honeymoon in Mexico, but I keep forgetting about making it! Thanks for giving me the kick in the taste buds that I need! Pinned! I've never made chimichurri before but I sure do love eating it. This is definitely a recipe I will be making.. thanks! Thanks Thaila. You will love this sauce with any kind of meat or poultry. Yummy! Looks like a great sauce to go with meat dishes!